The company unveiled three new devices including the HERO, an entry-level version which costs €125. The GoPro Hero4 Black, which can record 4K footage at 30 frames per second. GOPRO HAS UNVEILED the next lineup of its extreme sports camera, including a cheaper entry-level version. 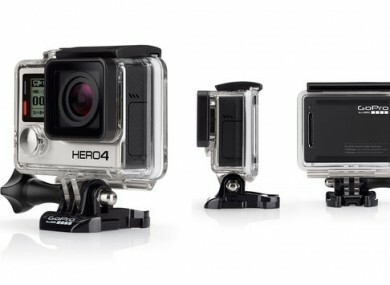 The three new GoPro cameras are the HERO4, separated into black and silver versions, and a new entry-level option called the HERO. The HERO4 Black is the high-quality version, allowing users to record 4K footage at up to 30 frames per second, or 2.7K footage at 50 frames per second. Recording video footage allows you to take 8.3MP photos from all of your recordings, but if you’re not shooting video, then it can take 12MP images at burst speeds of 30 photos per second. Getting one will set you back €480. The HERO4 Silver is almost identical to the HERO4 Black, except it cannot record footage at 4K quality. The best it can do is 1080p footage at 30 frames per second and it will cost you €380 to purchase. And then there’s the entry-level version, simply called the HERO, which is aimed towards those unfamiliar with GoPro and would like an accessible version to start off with. It’s able to record 1080p HD footage at 30 frames per second, or 720p at 60 frames per second, and costs €124. The three cameras will be made available on 5 October. Email “Put off by the price of a GoPro? Soon you will be able to get one on the cheap”. Feedback on “Put off by the price of a GoPro? Soon you will be able to get one on the cheap”.